Tough Love? | The Better Plan . . The Better Plan . .
. . is about understanding the power of choice, the freedom and responsibility that go with it, and the personal happiness that is the result. 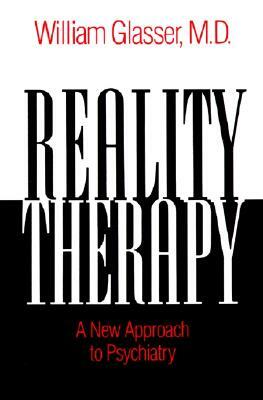 The above quote is from Reality Therapy, the book that propelled Glasser onto an international stage. While I am not a therapist the quote spoke to me as an educator, as I think students want something similar from us as principals and teachers. Students don’t mind being corrected, but not when it feels like they are losing a contest. Reality Therapy emphasized the idea of responsible vs. irresponsible behavior and Glasser became known for a get-tough approach, not only in psych wards and private practice offices, but in schools, too. Through Glasser’s writing and speaking, through advertisements in journals and magazines, and through word-of-mouth testimonials, educators became aware of his matter-of-fact toughness and it appealed to them. As he saw, though, how teachers were latching onto the responsibility theme, and how they wanted to blame students for their irresponsible behavior, Glasser pulled back from his use of the word responsible. His “toughness” was always meant to be cradled in what he called involvement. Involvement was about a warm, caring relationship between two people, a meaningful connection between therapist and patient, or in our case, between principal and student. It may be that we need to correct a student who makes a mistake, or that we need to correct a faculty member who uses poor judgment, but this interaction should not become a contest between two people. The skill lies in our ability to confront without attempting to control; to correct while preserving the student’s or faculty member’s sense of freedom. A spirit of wanting to feel in control and wanting to “win” interactions with others can run very deep in our personal way of being. Our lives are not easily compartmentalized and if we show up this way at school, chances are we will show up this way at home, too. Our spouse and our children may experience us in this mode on a regular basis. At least two bad things happen when we go into the control or contest mode. One, the focus becomes the contest, rather than the needed area of improvement. And two, the relationship is harmed. Whether between principal and student, husband and wife, or parent and child, a controlling interaction removes capital from a relationship bank account that is not that easily replaced. Over time a controlling approach can bankrupt even our most precious connections with loved ones. “Care for the flock that God has entrusted you. but because you are eager to serve God. but lead them by your own good example. Yet another jewel and timely post Jim. Goes right along with a book that the staff here at Livingstone are going through, The Anatomy of Peace by the Arbinger Institute. They propose that our hearts are in one of two possible modes – at peace . . . or at war. When our kids/students/employees/family/friends really whoever we have any type of relationship with behave, we interpret it and act with a heart at peace or a heart at war. Tying into Glasser’s Deadly Habits and Connecting Habits. As senioritis and spring fever hits our students it is even more important to maintain that heart at peace. “Care for the flock . . . ” love it. Thank you, too, for the information regarding this book. The books content really seems to have gotten your attention, as well as your colleagues at LAA. It really does boil down to your concise description – either we are at peace and are able to interact with others from this place of peace, or we are conflicted, frustrated, and at war basically, and interact with others from that perspective. Thank you for putting it into such understandable terms. You Make Me So . . . Choice Theory workshop at Pacific Union College this summer, 2019.